For those who value truth in media, well, sad to say Facebook is acquiring and retaining active users. Big tech stocks are dominating the market and Facebook is far out in front. Might as well write about kittens and cupcakes as try and make a living reporting news that mainstream media won’t touch but is vital for every living soul. Facebook Inc. (NASDAQ:FB) continues to push to new highs this year. The social networking giant has cemented itself as an important market leader once again, blasting off its post-election lows to help power the market higher in 2017. Facebook has already rewarded patient investors. Now we’re seeing plenty of room for this stock to run much higher over the next several months – and beyond. Sure, Facebook has more than its fair share of detractors these days. The naysayers claim kids aren’t using the platform anymore. Its ads aren’t as effective as they could be. And the stock is just too damn expensive at current prices. We think that’s a load of bunk. 1. Facebook is acquiring and retaining active users. Analysts throw big numbers around all the time — even trillions (we’ll touch on that a little later). And we’re not just talking monthly users, either. 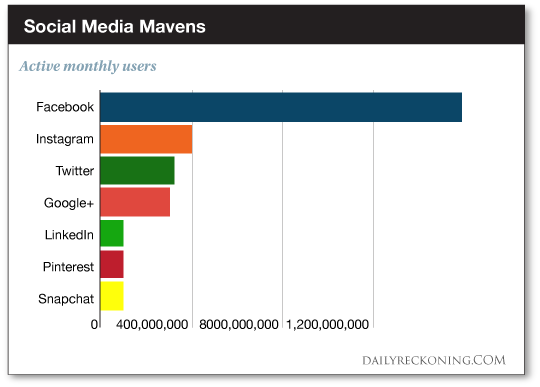 Facebook is garnering 1 billion-plus active daily users. Facebook might be the old man in the room compared to some of its newer competitors like Snapchat – run by parent company and brand new public company Snap Inc. (NYSE:SNAP). But Facebook hasn’t experienced that flat-lining engagement trend that haunts most social media players in the market. With 85% of the sites users coming from outside the U.S. and Canada, Facebook has entered bidding war for the rights to broadcast cricket to their second largest market: India. With the craze we’re seeing by other top dogs for payTV (Google, AT&T, etc.) this move could be huge for Facebook. Facebook has grabbed almost every eyeball on the Internet already – 72% of all internet users in the U.S. alone. And the site continues to keep users coming back day after day with engaging new applications. The company just announced that it is adding food delivery services that will work directly and seamlessly through the Facebook mobile app. That means more and more of Facebook’s largest demographic will be adding a few daily visits to Facebook to get their fix. Facebook isn’t just tackling mundane first-world problems like customized food delivery. It also has its hands in high-tech developments to help get its products in the hands of every person on the planet. Even virtual reality has become a huge interest for Facebook. Videos of Oculus Rift demos, Facebook’s answer to VR competitors, have started making the rounds. All of VR’s applications are going to be incredibly lucrative and Facebook is going to be competing with the best as Oculus Rift garners more attention. 3. The next trillion-dollar company? The race is on to see which company will be the first to earn a market value of $1 trillion. A few of the world’s biggest public companies are steadily creeping toward the trillion-dollar mark. Facebook is one of them. Whether it’s first across the finish line remains to be seen. But we can make a compelling case for the social networking king. Facebook is sitting just under Amazon at a $400 billion market cap and steadily gaining. Facebook is also going head-to-head with fellow $1 trillion-seeker Google. And if Facebook gets its way, it could be the next major search engine. The site has already indexed 2 trillion posts and is racking up posts at 1.5 billion per day. And it already accounts for 1 in 5 page views on the web today. If you’re not focused on Facebook, you’re missing one of the biggest growth opportunities in the world. Watch this stock continue to post new highs (and potentially shove more money in your pocket) as the year progresses.